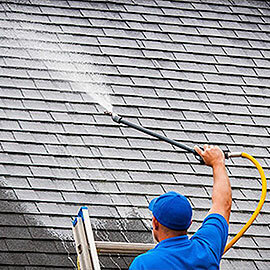 Shine Select specializes in residential and commercial roof and exterior cleaning along with gutter and window cleaning. Our service areas are Northern Virginia, Washington DC and Maryland. We are fully licensed and insured, and our main focus is always the customer's satisfaction. We are committed to providing high-quality services while taking into consideration our clients time and budget restraining. 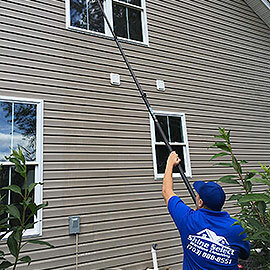 Low-pressure application removes algae and mold from all types of siding. Low-pressure roof cleaning can remove black streaks, algae, and mold that are eating away the lifetime of your roof. We can have your concrete brick and stone surfaces look great again. 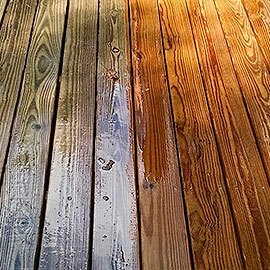 Low-pressure cleaning can restore your deck or fence without the risk of damage. 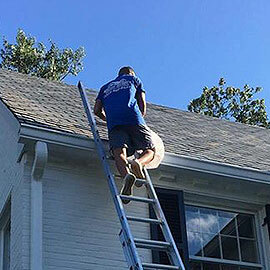 Gutter cleaning services will guarantee you clean and free-flowing gutters. Regularly cleaning the windows of your home will protect the glass from permanent water spots. 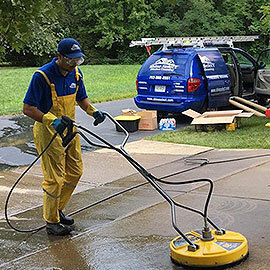 Pressure washing cleans exterior services through high pressure water that typically fires off with 3000 psi of water per second. That could only blast away the top layer of the dirt and potentially strip your exterior surface. The Large exterior stains are actually microorganisms like algae mold and moss that grow on the surface. When you use a pressure washer to clean these stains you are only cleaning the visible part of the bacteria but not the origin of the problem. 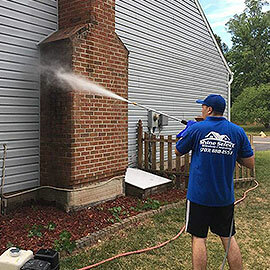 Softwashing is a safer and more effective power washing alternative that can remove the stained spots from the origin of the bacteria and without the potential to damage your exterior surfaces. More solid surfaces might require pressure washing to breakdown the infestation but the delicate surfaces will always be softwashed. 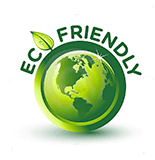 Shine Select is proud to be using bio friendly products from SoftWash Systems. Our technicians mix custom solutions depending on the surface and then rinse them with our low pressure water system. Our systems have been proven to deliver great results for over twenty years by using green products that are not harming the environment. The softwashing cleaning lasts 4-6 times longer than just pressure washing. Getting your home maintained should not be a challenge. When we take a job we strive to not just deliver a result, but the best result and experience you could ever receive. That is why we use the latest technology and professional detailed approach to ensure the great outcome of each project. Our customer satisfaction is our top priority. That is what sets us apart from the rest of the companies. Certifications and affiliations that make us better.